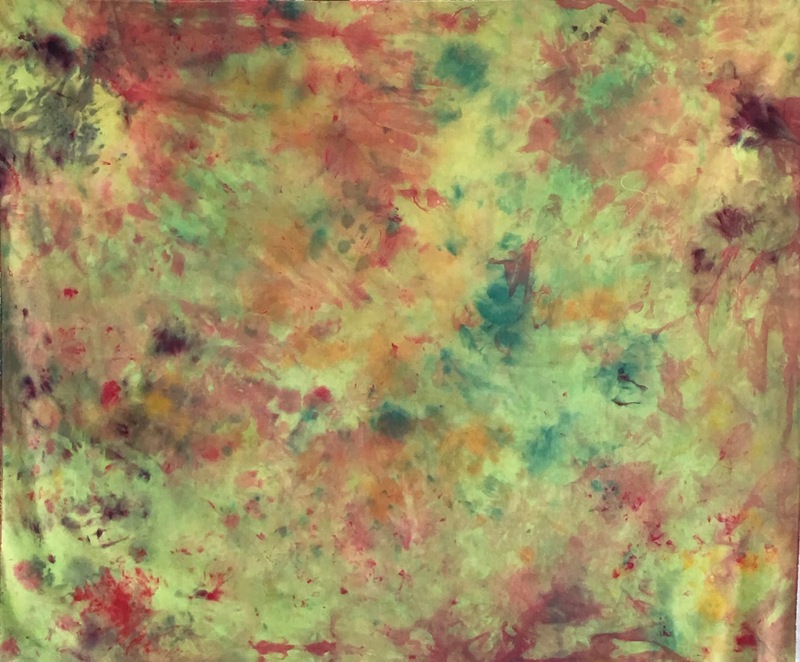 Studio Jules Art - Blog: What a Fun Dye Class! Yesterday was a fun day in the Dye Studio. The Etc. Art Quilt Group came and had a creative day. Sorry to say, we were having so much fun that I forgot to get a class picture! These 8 ladies were a blast and I look forward to them coming back to play. We ice dyed, parfait dyed and container/zip lock bag dyed. 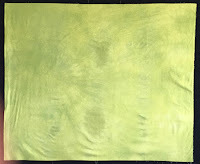 To not waste any dye, I grabbed a piece of Lemon Lime fabric that was not on the exciting side of things and we used it to wipe our dye spoons and the blades to the mixing bullets. Here are the Before, During and After pictures. I also grabbed an old undershirt from Jeff's drawer and used it to wipe the bullet cups from when we mixed dye for container dyeing. This is now my favorite shirt. 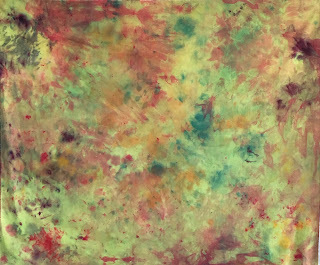 I have a few pieces that I set to ice dye during the class, but haven't had time to wash them out yet. That will be another blog post. Several of my dye students have asked if I rent out the dye studio so they can come dye and not have instruction. What a grand idea! So, I have made a cost schedule and it is posted under the Class and Workshop tab on my website. Just click over and check it out! Contact me with the days/times you would like to book. You can book during the week or on the weekend. I have two sinks and plenty of room and ice! Until next time, don't forget that the unplanned dyeing can sometimes be your favorite!